The oil and gas industry is moving toward just-in-time (JIT) delivery, which means connector manufacturers must have quick leads times and meet promise dates. Customers for components such as connectors, cable assemblies, and sensors are not willing to hold large amounts in inventory. With long lead times and last-minute design changes, it can be difficult to source electrical connectors when time and cost is critical. These are make-or-break considerations: if you have an unsuitable connector, or no connectors at all because of long lead times, nothing else really matters. These kinds of projects, common to the oil and gas industry, require connectors that are cost-effective, readily available in large numbers, and high-performing in harsh environments. One potential solution is Amphenol AIT and ITT Cannon CT connectors. Amphenol AIT connectors are threaded circular MIL-DTL-5015 connectors that are designed for excellent performance in the type of harsh environments often found in Oil & Gas applications. These 5015 connectors are securely sealed with a resilient neoprene insulator and rear-seal grommet to provide a liquid-tight assembly, allowing them to withstand moisture, dust, condensation, and similar contaminants. Amphenol AIT electrical connectors are also resistant to vibration and flash-over. Their operating temperature range is -67°F to +257°F, further adding to their suitability for difficult working conditions. There are over 286 contact layouts available with five mounting styles, nineteen different shell sizes (with all shells made from a corrosion-resistant Aluminum alloy), and the option for the termination to be either soldered or crimped. These variations support a mix of contact types: power-only, signal-only, or power + signal. 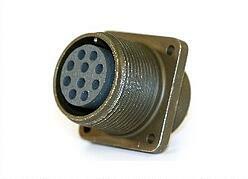 The ITT Cannon CT are heavy-duty connectors that were originally designed for aerospace applications but have become popular in both military and commercial applications. They are manufactured to MIL-5015, making them ideal for the aggressive environments found in top-hole petroleum applications. These robust MIL-DTL-5015 connectors are waterproof, sealed to withstand moisture, flash-over, and vibration, and they have an operating temperature that ranges from -67° to +257°F. 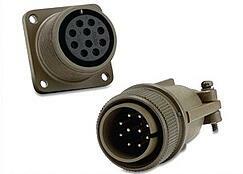 All solder receptacles have inserts and contacts bonded in place in accordance with the MIL-DTL-5015 specifications. The panel itself uses gaskets and seal screws to protect from leaks around the connectors. The threaded coupling used with the ITT Cannon CT connectors provides superior EMI/RFI shielding without the need for special grounding spring components. The standard CT coupling nuts contain holes for lock wires used in high-vibration or security applications. As is the case with the Amphenol connectors, ITT Cannon CT connectors are available in hundreds of contact layouts. Both connector series are great cost-effective alternatives to similar products in the market, especially when your bottom line is most important. Connector kits provide further streamlining and simplification for the assembly process, giving great benefit in instances where there are multiple systems and connectors included in the application. Kitting simplifies the customer's experience by reducing the number of separate line items that must be purchased. Even if the parts are coming from more than one manufacturer, they can be custom kitted into a single package. Engineering receives the components packaged together, contributing to a more efficient build process and speeding up assembly time. The oil and gas industry demands high-performance connectors that can function in aggressive environments. Amphenol MS series connectors and ITT Cannon CT connectors are just a few examples of reliable, well-engineered solutions that can be combined to meet even the most stringent engineering specifications. Partnering with a team that not only supports JIT delivery but also remains flexible enough to support last-minute engineering change notices is critical. We understand that you do not hold a massive number of components in inventory, largely because an engineering change notice or obsolescence of a part can render that inventory useless. That is exactly why PEI-Genesis offers a bonded inventory program and provides a 48-hour turnaround time on custom connectors: we handle the logistics of quickly getting the right connectors in your hands, so you can make high-quality products in a timely fashion.